It’s been a while since my last post, and I really felt like I couldn’t leave ya hangin’ :D.
I have a quick question to ask before we move on. Well, that’s my question, and I’m sure you’ve asked yourself the same thing a million times before! Let’s be honest. It’s a good question and one worth asking! Who am I? What am I? If I can’t face myself and who I am, then how can I face God? Am I loved? Am I shameful? So, you see, that one question leads to many! When we are in a raging battle, and we are faced with those questions, what do we do? We hide (I do, anyway!). We fight to stay away from whatever Christ has for us because feel we aren’t good enough. Even when Christ has told us He has something special or terrible (that will end up good), we hide our true selves and try to vanish from His sight! But he always knows where we are. It reminds me of King Ahab in the Bible. King Jehoshaphat of Judah teams up with him to fight the Armeans, and they consult all the prophets. Until they all give Ahab the same answer: “You’ll do great!” Jehoshaphat doesn’t buy it and says,”Can we call a prophet of God?” Except that Ahab hates the real prophet and doesn’t like him at all! When they ask him what God says, the prophet says,”Ahab’s gonna die in battle and all these prophets have been given a lying spirit from God.” 😀 Now Ahab hates this guy even more and and puts him in the dungeon. Alike Ahab, God tells us what’s going to happen to us, good or bad, and we hide our faces from Him and we still get what He promised! Again, good or bad. God will hit us with reality! The arrow of peace, reproach, love, blessing, death, sadness, joy, etc. All will go out for the good, and we have to be ourselves to accept it! It’s truly a dorky example, I admit, but the concept is there! We want the blessing, but our true self is hidden and we can’t accept the incredible blessing because we have hidden who God has made us to be! I’m sure by now you’ve noticed the widget on my sidebar that says Gospel for Asia Blogger. Well, that’s what I am. I’m part of the Gospel for Asia Blog team. The post about Ruth was a topic I had been assigned to blog about (click here for that post). 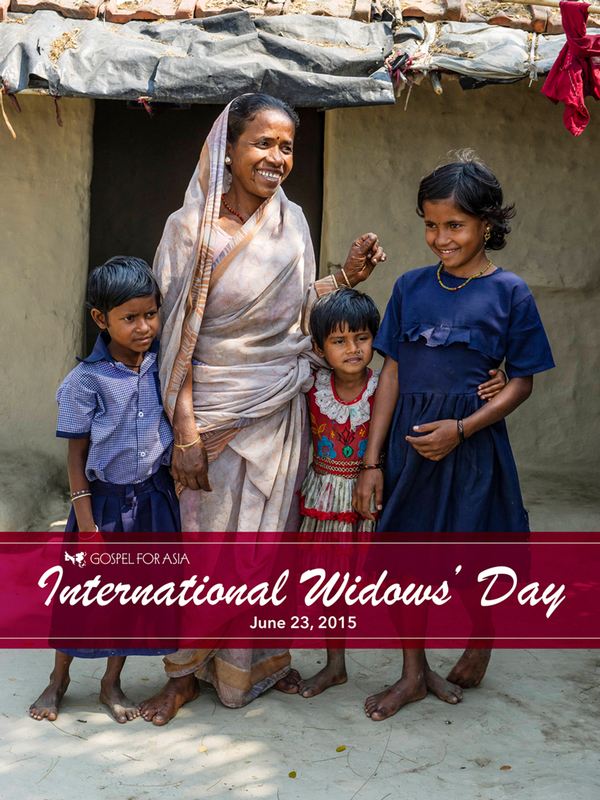 I might add that today, June 23rd is International Widow’s Day. In the United States, widows are loved, taken care of, and safe. Asia is a different story. If your husband has been killed, it’s your fault. Your family now hates you, and your children, mother, father, and in-laws abandon you for dead. Most widows, like Netramani, flee to a place called The Island of Widows in West Bengal because their true identity will kill them or keep them neglected an unloved for their whole life. The majority of them commit suicide because they have nothing to look forward to or live for. To earn money, they sell their bodies for prostitution or beg on the street. The plight of a widow in Asia is extremely sorrowful and if anyone has to hide their identity, it’s them. Dear sisters, we have been made with a character, personality, and interests God has given us. Don’t throw it away to be cool! When you are tempted to give up who you are, remember the suffering identity of a widow in Asia. We are Christ’s special creations made with special quirks that He’s made in you for His glory! By the way, Netramani has found faith in Christ and is serving Him wholeheartedly. http://www.gfa.org/veiloftears/donation/ and click on Gifts of Empowerment. All resources provided by Gospel of Asia Blog Team. P.S. My dad said it’s hard to tell where to subscribe to my posts, so just so everyone knows, there is a little blue button that says follow above the archives widget on the right sidebar. 🙂 thanks!